"Webbs Depth of Knowledge provides a vocabulary and a frame of reference when thinking about our students and how they engage with the content." 1. How will you plan to use this in your classroom? During whole group or small group instruction, and why? 2. 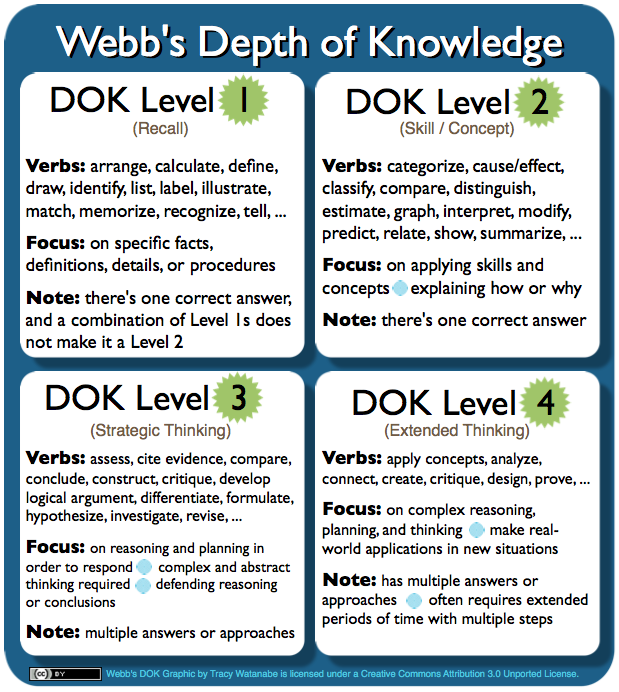 When do you see the need to use DOK Question Level 3 and DOK Question Level 4 in your classroom? 3. 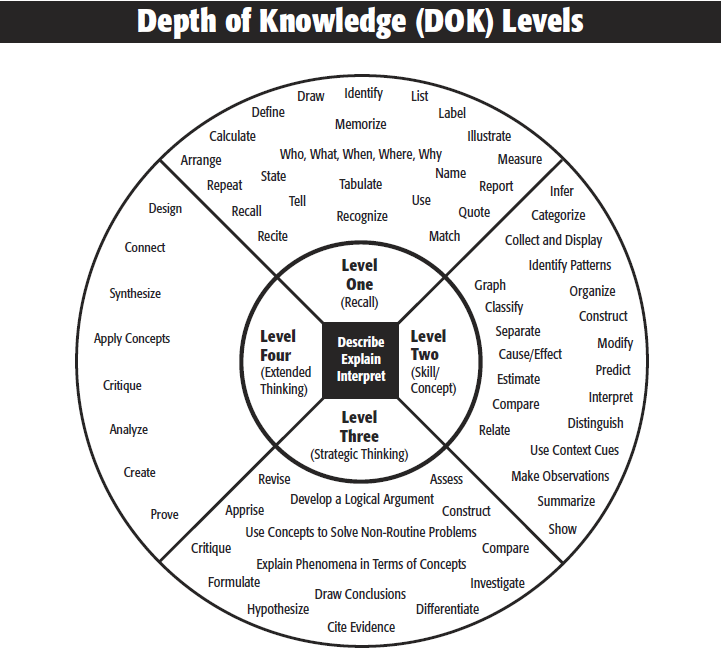 Looking at your content and standard's objectives, create 3-4 questions using DOK Level 3 and DOK Level 4. Example 1: Students will graph the point (1,6) in the first quadrant of the coordinate plane. Example 2: Students will identify a transformation within a plane. Example 3: Given the coordinates of the endpoints of a segment, graph the midpoint of the segment. Example 1: Students will graph the vertices of the reflected image of a triangle. Example 2: Students will perform a compound transformation of a geometric figure within a coordinate plane. Example 3: Given three vertices of a parallelogram, graph the coordinates of the fourth vertex. Example 1: Given the coordinates for three vertices of a rectangle, students will graph the coordinates of the fourth vertex. Example 2: Students will perform a geometric transformation to meet specified criteria and then explain what does or does not change about the figure. Example 3: Graph the four vertices of a quadrilateral, and then use slope and distance formulas to determine the best classification for the quadrilateral. Example 1: Students will graph the vertices of a triangle onto positive coordinate planes using different scales and analyze what changes in the figure are affected by the changes in scales and explain why. Example 2:Students will abstract the transformations occurring in an Escher woodprint and then create a simplified tessellation of their own. Example 3: In an equilateral triangle, graph the perpendicular bisectors of each side using slope and midpoint, and then compare those results with constructions using a compass and straightedge. Compare and contrast the results.